"Five and dime", "99 cents store", and "Dollar store" redirect here. For the cartoon, see Five and Dime. For other uses, see Convenience store and Dollar store (Cuba). A variety store (also pound shop, dollar store, and other names) is a retail store that sells a wide range of inexpensive household goods. Variety stores often have product lines including food and drink, personal hygiene products, small home and garden tools, office supplies, decorations, electronics, garden plants, toys, pet supplies, remaindered books, recorded media, and motor and bike consumables. Larger stores may sell frozen foods and fresh produce. Variety stores arose in the early 20th century, with Woolworth's model to reduce store overheads by simplifying the duties of sales clerks. They may now be found all over the world. A variety store often sells all goods at a single price, in which case it may be called a price-point retailer. The name of the store often reflects this, and in different markets it may be called a dollar store, pound shop, euro store and so on. Buying and selling huge amounts of goods at heavily discounted prices provides a small profit margin that is multiplied by the volume of sales. Pricing many items at prices that are higher than regular retailers. These goods are commonly bought by consumers who perceive them to be bargains based on the heavy discounts on other items in the store. In the case of fixed price-point retailers, this can be achieved by reducing the size of the package to one that is smaller than what is found in other retail outlets. generic brands or private labels, often specially manufactured using cheaper materials and processes than usual. available through the grey market. bought at a closeout sale, such as seasonal or promotional goods or bankruptcy stock. sold in smaller unit sizes than elsewhere. Not all variety stores are "single price-point" stores, even if their names imply it. For example, in the United States, Dollar General and Family Dollar sell items at more or less than a dollar. Some stores also sell goods priced at multiples of the named price and, conversely, multiple items for the price. The discrepancy with the nominal price is also compounded if sales tax is added at the point of sale. Another source of stock is overruns, surplus items and out-of-date food products. Real Deals, a regional dollar store in the Syracuse, New York area, is stocked almost entirely with surplus goods such as these. The legality of selling out-of-date goods varies between jurisdictions: in general, most items (with a few exceptions, particularly certain perishable food items depending on the state) can be sold in the United States regardless of their sell-by date, but in the United Kingdom it is illegal to sell goods after their "Use By" date. Although some people[who?] may link variety stores with low-income areas, this is not always true. For example, Atherton, California has a variety store within its city limits, even though it has a median household income of nearly $185,000 a year. Studies of food discounters in Great Britain show quite a varied demographic, and 99p Stores reported an increase in higher-income customers after the financial crisis of 2007–08. "Five and ten" redirects here. For the 1931 movie, see Five and Ten (film). "Five and dime" redirects here. For the Oswald the Lucky Rabbit short, see Five and Dime. "Nickel and dime" redirects here. For the book, see Nickel and Dimed. 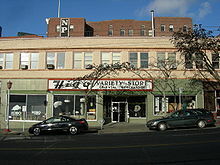 An art gallery in Seattle's International District preserves the facade and some features of Higo Variety Store, an independent Japanese-American five and ten. Kress Stores contributed iconic buildings to many American downtowns. This one is in Tampa, Florida. F. W. Woolworth and S. S. Kresge stores on Lackawanna Avenue, in downtown Scranton, Pennsylvania. The two stores were often found near one another in downtown areas. The concept of the variety store originated with the five and ten, five and dime, nickel or dime, and ten-cent store or dime store (10 cents), a store offering a wide assortment of inexpensive items for personal and household use. [not in citation given] The originators of the concept were the Woolworth Bros., in July 1879. Woolworth Bros. later became F. W. Woolworth Company or just "Woolworth's." On 21 June 1879, Frank Winfield Woolworth opened his first successful five-cent store in Lancaster, Pennsylvania, after a failed attempt with a store he opened on 22 February 1879, in Utica, New York. Frank soon brought his brother Charles Sumner "Sum" Woolworth into the business. Together they opened a second store in Harrisburg, Pennsylvania, on 18 July 1879. Before they started their own stores, the Woolworth brothers worked for Augsbury and Moore, a dry goods store in Watertown, New York. It was they who trained the Woolworth brothers and lent Frank $300 in goods. Frank settled his debt by the time he opened the Lancaster store. Frank experimented with a 10¢ table in Lancaster, and similarly to his experiment of a 5¢ table at Augsbury and Moore, it was a success. Sum managed the Harrisburg store, crammed it with goods, hired clerks, and also added a table with a ten-cent line of goods. Once again, the approach was a huge success. Because of a rent dispute, Sum soon moved the Harrisburg store to York, Pennsylvania, and on 6 November 1880, he opened the store in downtown Scranton, Pennsylvania, and formally called it a "5¢ & 10¢ store". There, he developed and fully established the nickel-and-dime concept into American culture. Frank spent time opening more stores, working the back end of the business, buying in bulk for all affiliates and "friendly rivals," and buying from manufacturers to keep prices low. Meanwhile, Sum used his store to train new managers and develop many of the Woolworth concepts which included bright lighting, a polished high-luster floor, glass showcases, mahogany counters, and goods people could touch. Before this, clerks had to work with each customer individually, handing them goods from cases or shelves. This required more clerks, with greater knowledge, and so cost more. Before Woolworth, the prevailing thought was an entire store could not maintain itself with all low-priced goods. The Woolworth Bros. and their affiliated partner stores originally featured goods priced at only five cents and ten cents. Many other people tried to copy their lead. Later in the twentieth century the price range expanded; originally Woolworths did a strictly "five-and-ten cent" business, but in the spring of 1932, a 20-cent line of merchandise was added. On 13 November 1935, the company's directors decided to discontinue selling price limits altogether. Inflation eventually dictated that the stores were no longer able to sell any items for five or ten cents, and were then referred to as "variety stores" or more commonly "dollar stores." Using the Historical Consumer Price Index for January 1913 and November 2018, an item costing $0.05 in January 1913 would cost $1.29 in November 2018 dollars, all other things being equal. Of these, only Ben Franklin continues to exist in this form, while Kresge and Walton's became mega-retailers Kmart and Walmart. The last US Woolworth's-branded variety store closed in 1997; however the Woolworth company had success with its subsidiary sports retailer Foot Locker, and the company's name has been officially changed to Foot Locker to reflect the new focus of the business. Beginning around the 1960s, others tried the larger "discount store" format as well, such as W.T. Grant, Woolworth's Woolco stores, and TG&Y Family Centers. Woolworth's opened its first store in the United Kingdom in 1909, when they were also colloquially known as "threepenny and sixpenny" stores, "3d and 6d" being displayed on the shops' frontages. In Japan, 100-yen shops (百円ショップ hyaku-en shoppu or 百均 hyakkin) have proliferated since around 2001. This is considered an after-effect of a decade-long recession of the Japanese economy. Despite the emphasis on value, however, some items, such as chocolate bars, may be priced higher than they are at other stores. For a few years, 100-yen shops existed not as permanent stores, but as vendors under temporary, foldable tents. They were (and still are) typically found near the entrance areas of supermarkets. A major player in 100-yen shops is the Daiso chain. The first store opened in 1991, and there are now around 2,400 stores in Japan. This number is increasing by around 40 stores per month. Daiso has also expanded into North America, Australia, Asia, and the Middle East. In China, ¥2 (or ¥3, depending on the area's economic prosperity) shops have become a common sight in most cities. In Hong Kong, major department stores have opened their own $10 shops (US$1.28) to compete in the market, and there are now "$8 shops" (US$1.02) and even "$2 shops" (US$0.26) competing at lower prices, especially in poorer communities. Low prices are helped by Hong Kong's lack of a sales tax and its proximity to China. In Taiwan, fixed price stores can be found in many locations, including night markets, regular shopping streets, regular market stalls, and department stores. Two typical price points are NT$39 and NT$49. Given that the retail environment in Taiwan is already highly competitive, it is not unusual to see such stores fail. Typically the goods for such stores are manufactured in China to keep costs down. In India, US Dollar Store, founded in 2003, is a pioneer of single price stores. The merchandise for pilot stores was sent from America. As sales grew over the years with more than 200 operational stores in India, the merchandise is now imported from China, Indonesia, Thailand, Spain, Portugal, UK and various other countries as well as the US. US Dollar stores were founded by entrepreneur Gaurav Sahni, owner of Nanson Overseas Private Limited. Nanson, operated by Gaurav Sahni and his brother Gautam Sahni, has had an established sourcing and consolidation network for over two decades, with supply bases worldwide. Direct sourcing without intermediaries and stocking a large variety of merchandise as and when needed has given the company an advantage. In Spain there are Todo a 100 shops ("everything for 100 pesetas" (€0.60)), although due to the introduction of the euro and inflation, most products cost a multiple of €0.60 or €1. Most of these shops maintain their name in pesetas, and most of them have been renamed as Casi todo a 100 ("almost everything for 100 [pesetas]"), Todo a 100, 300, 500 y más ("everything for 100, 300, 500 or more") or Todo a un euro. Colloquially, the expression todo a 100 implies that something is either cheap, kitsch or low quality. In Portugal, there were Trezentos shops (300 escudos, €1.50), but with the introduction of the Euro currency, this designation is not used nowadays and the terms 'bazar' or 'euro store' are preferred. In Germany, there are ToBi (German: Total Billig, "Totally Inexpensive") stores where most items cost one or two Euro or less. In Hungary, there are 100 forintos bolt ("100 forints store") stores, but they do not form a single chain, instead of being operated by small, independent companies. The HEMA chain started in the Netherlands, sell goods using standard prices of 10, 25 or 50 cents, and later also 75 and 100 cents. After World War II, this model could not be sustained and the standard pricing system was abandoned. HEMA is the abbreviation of Hollandish standardized prices company (Dutch: Hollandse Eenheidsprijzen Maatschappij). The HEMA had some 500 Dutch stores in 2011 and also operates in Belgium, Germany, Luxembourg and France. Since 2016 the chain is expanding in to other European countries such as Spain and the United Kingdom. In Belgium: Action, HEMA and Zeeman. In the Netherlands: Action, Big Bazar, Euroland, HEMA and Zeeman. In Sweden: Bubbeltian, called by some Tian, a colloquialism for ten kronor, US$1.20. Another chain that has been spreading in Sweden during the last seven years is Dollarstore, a chain where everything costs either 10, 20, 30, 40, 50 and steps of 50 up to 500 kr. According to IBISWorld, dollar stores have grown 43 percent since 1998 and have become a $56 billion industry. Colliers International claims there are more dollar stores than drug stores. With stores of other types closing in large numbers, dollar stores often replace other types of stores in shopping centers. They succeed partly because of impulse purchases. In Australia the main variety stores now consist of The Reject Shop, Daiso, Shiploads (in Tasmania), and a variety of smaller chains and independent shops. Former chains include Crazy Clark's, Homeart, Sam's Warehouse, Clint's Crazy Bargains, Go-Lo and Chickenfeed. In Argentina, variety stores are called todo por dos pesos (everything for 2 pesos). Brazilians sometimes use the expression um e noventa e nove to refer to cheap, low quality things or even people. In Chile, they are called todo a mil (referring to the one thousand Chilean pesos banknote). They are commonly located in middle-class neighbourhoods where big retail stores don't usually venture and in small commercial districts like the ones in Santiago. Dollar store, $1.25 store, 99-cent store, etc. in the United States and Canada plus other names. Dollar store is used predominantly, even when the maximum price point is higher than one dollar. Some chains emphasize that the price is an even amount: $2, $5, etc., instead of having odd, "uneven" prices. In November 2010, a piece of installation art called £100 Shop was exhibited in Dalston, London, presenting items from a pound shop as if they were unique luxury items. The items were genuinely offered for sale, albeit with a labyrinthine sales contract. ^ Barmash, Isadore (22 November 1983). "Lamston Still Small and Local". New York Times. Retrieved 7 March 2015. ^ a b c Wallop, Harry (14 September 2012). "How Poundland makes its millions". Daily Telegraph. Retrieved 8 September 2013. ^ a b c Hall-Davis, Amanda (21 April 2011). "£1 stores can cost you more". Yahoo Finance. Archived from the original on 15 April 2012. Retrieved 8 September 2013. ^ Tobin, Dave (April 2009). "Business is booming for Auburn-based dollar store chain". The Post-Standard; syracuse.com. Retrieved 20 April 2012. ^ "Did you know that a store can sell food past the expiration date?". US Food and Drug Administration. 13 April 2013. Retrieved 8 September 2013. ^ "Guidance on the application of date labels to food" (PDF). UK Department for Environment, Food and Rural Affairs. September 2011. p. 6. Retrieved 8 September 2013. ^ "Atherton, CA Real Estate Data". RealEstate.com. Archived from the original on 11 September 2012. Retrieved 8 September 2013. ^ Thompson, Chris; Clarke, Graham; Clark, Martin; Stillwell, John (October 2010). "Modelling the future opportunities of food retailing in Great Britain" (PDF). demographicsusergroup.co.uk. University of Leeds. Archived from the original (PDF) on 10 August 2013. Retrieved 8 September 2013. ^ Harrison, Nicola (26 June 2009). "99p Stores guns for growth as profits soar". Retail Week. Retrieved 8 September 2013. ^ "Random House Kernerman Webster's College Dictionary: dime store". thefreedictionary.com. Random House. 2010. Retrieved 8 September 2013. ^ Plunkett-Powell, Karen (1999). Remembering Woolworth's: A Nostalgic History of the World's Most Famous Five-and-Dime. St. Martin's Press (New York). ISBN 978-0312277048. ^ "CPI Inflation Calculator". US Department of Labor Bureau of Labor Statistics. Retrieved 13 December 2018. ^ Hayward, Walter Sumner; and Percival Albert Frederick White; chapters by John S. Fleek and Hugh MacIntyre (1922). Chain stores: their management and operation. McGraw-Hill Book Co. Inc; printed by The Maple Press (York, PA). ^ Martin, Douglas (1 June 2002). "David Cohen Is Dead at 80; Led Chain of Bargain Stores". The New York Times. ^ "John's Bargain Store (John's, 512 E. 14th St. between Ave. A and Ave. B (1986))". 14to42.net. Retrieved 4 September 2016. ^ "Woolworths Group plc". encyclopedia.com. 2007. Retrieved 8 September 2013. ^ "Woolworth store openings in the 1930s". woolworthsmuseum.co.uk. 3D and 6D Pictures Ltd. Retrieved 8 September 2013. ^ Bender, Andrew (27 June 2010). "Bargain hunting at Japan's 100-yen stores". Los Angeles Times. Retrieved 28 October 2014. ^ "Dollar stores among the new retail powerhouses". News & Record. 26 January 2012. Archived from the original on 30 July 2012. Retrieved 8 September 2013. ^ "99 Cents Only Stores Reports Strong Fourth Quarter And Full Year Fiscal 2017 Results". 99 Cents Only Stores. Archived from the original on 13 August 2017. Retrieved 5 May 2017. ^ "USA Store Locator, DAISO JAPAN". Daiso Japan. Retrieved 5 May 2017. ^ "Dollar General Reports Fourth Quarter and Fiscal 2016 Financial Results; Company Provides Financial Guidance for Fiscal 2017". Dollar General Newsroom. Retrieved 5 May 2017. ^ "Five Below, Inc. Announces Fourth Quarter and Fiscal 2016 Financial Results". Five Below, Inc. Archived from the original on 21 April 2017. Retrieved 5 May 2017. ^ "Fourth Quarter MD&A" (PDF). Dollarama Financial Information. Archived from the original (PDF) on 30 June 2017. Retrieved 5 May 2017. ^ "The £100 Shop". Hackney Citizen. 12 November 2010. Retrieved 8 September 2013. This page was last edited on 2 April 2019, at 09:35 (UTC).